Large tapestries depicting biblical scenes were popular in rural Norway in the 1600s and 1700s. Draped over a bed, they provided warmth, decoration, and moral instruction. 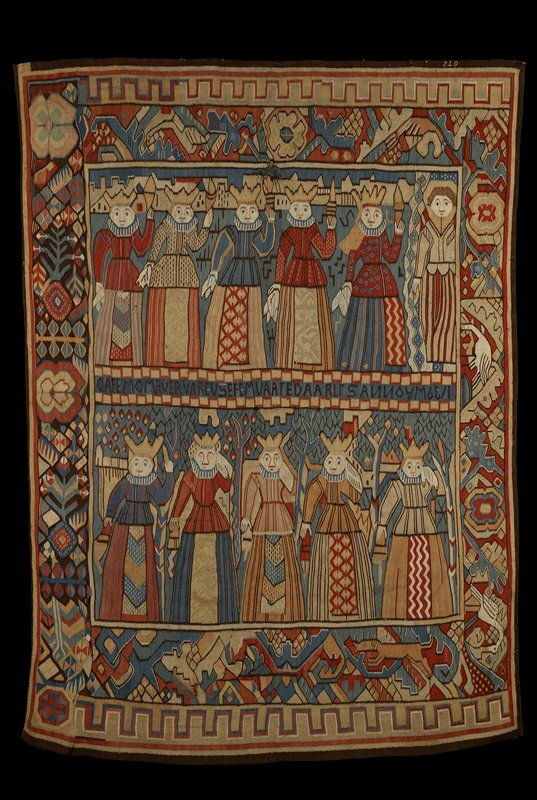 This tapestry illustrates the parable of the wise and foolish maidens, as recounted in the gospel of Matthew in the Christian Bible. The figures at the top represent the wise maidens, whose oil-filled lamps light the path, guiding the bridegroom to the wedding feast. In the lower register, the foolish maidens with their empty lamps weep into their handkerchiefs upon learning that they have been excluded from the celebration.